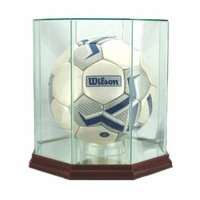 Scroll down to see our great selection of ball holders and acrylic display cases. Add an optional engraved plate to help commemorate special events. Also see our Acrylic Brochure & Advertising Displays and our great selection of Trophy Cases. Jersey Holder (Acrylic)These Jersey Holders come in three sizes and are constructed with an aluminum frame and black finish. Acrylic Boxing Glove Display CaseBoxing glove display with black base and acrylic top. Available in single-glove or two-glove styles - click on picture for details. 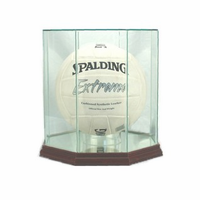 Volleyball Display Case (Glass, Octagon)This beautifully designed�Octagon Volleyball Glass Display Case is a perfect way to display your Volleyball. 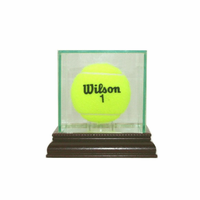 Glass Tennis Display CaseDisplay your cherished tennis ball with our Glass Tennis Ball Display case. 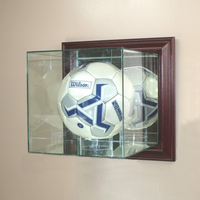 Soccer Display Case (Glass, Wall-Mounted)This is a beautifully designed wall mounted soccer display case. � Our unique design includes a hinged top for easy access inside. 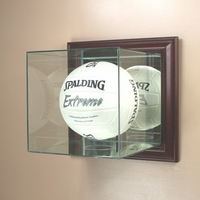 Volleyball Display Case (Glass, Wall-Mounted)This is a beautifully designed wall mounted volleyball display case. � Our unique design includes a hinged top for easy access inside. A collection of free-standing and wall-mounted golf ball displays. Race car and racing helmet displays. 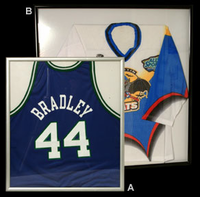 Whether you need one display case for a special ball, or several for your entire collection, we can help. Many of the items in the sections above are available with optional engraving. Since 1999, Trophy Central has been serving customers with top-rated customer service. Please feel free to call us if you need any help and experience the Trophy Central difference!